"The Jewish Quarter of Jerusalem with its two synagogues. Palestine." 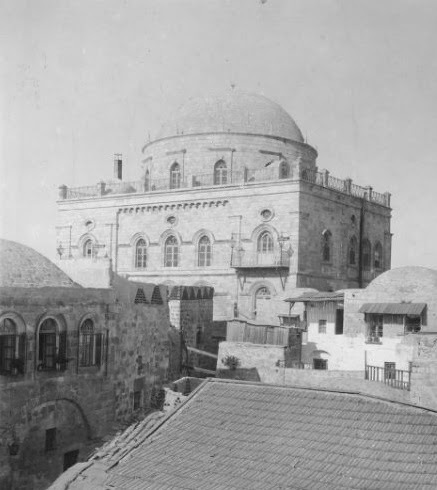 This picture of the two domes of the Hurva and Tiferet Yisrael Synagogues in Jerusalem's Old City has been featured in our postings before after we found them in various collections. But we never came across a photo with such clarity, suggesting that the archives at UC-Riverside contains the original photos taken by the Underwood & Underwood Co. in 1900. UC-R's files also allow huge and detailed on-screen enlargements of the photos. We thank the heads of the library for permission to republish their photos, and we abide by their request to limit the photos' sizes on these pages. The Keystone-Mast collection at UC-R also contains other photos of the exterior and interior of the Tiferet Yisrael and the Hurva Synagogues in the Old City in the middle of the 19th century. 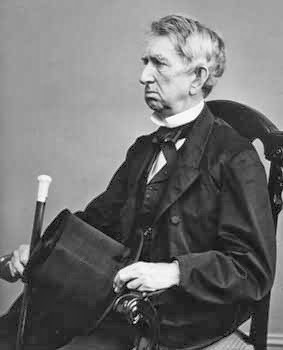 William H. Seward, who served as President Abraham Lincoln's secretary of state, visited Jerusalem in 1859 and 1870. He wrote a travelogue after his second trip, and he described attending Friday night services at the "Wailing Wall" and in one of the two impressive synagogues. Seward's description appears below. 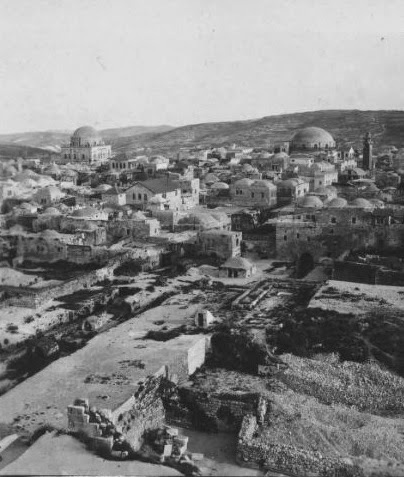 The two prominent synagogue domes shared the panoramic view of Jerusalem with the domes of the Dome of the Rock and al Aqsa Mosque for almost 80 years. In the course of the 1948 war, the Jordanian army blew up both buildings and destroyed the Jewish Quarter of the Old City. 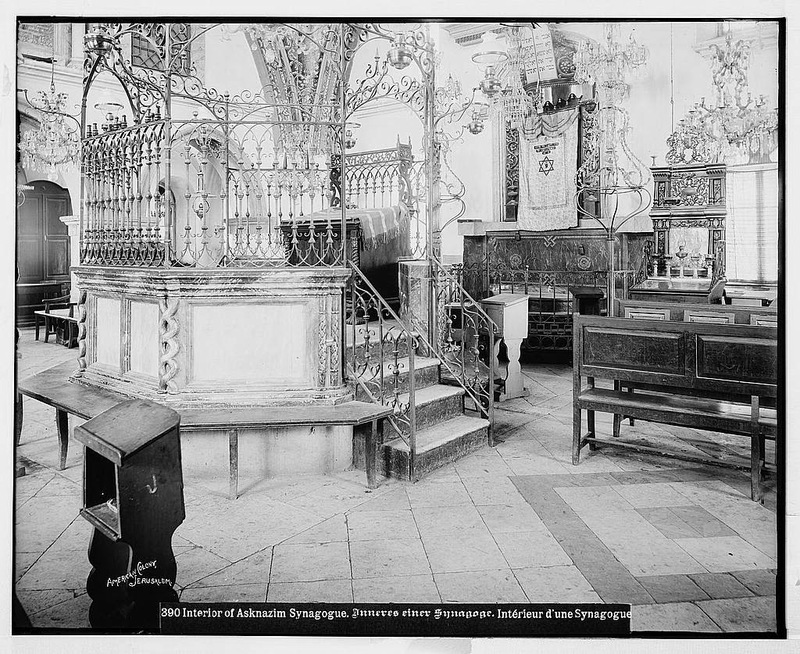 We present below interior pictures of the two synagogues from the UC-R and Library of Congress collections. Note the curtains covering the Ark containing the Torah scrolls. When the German Emperor arrived in Jerusalem in 1898, the Jewish community constructed a welcome arch, photographed by the American Colony photographic department. The curtains from the synagogues and the Torah crowns were taken down to decorate the arch. 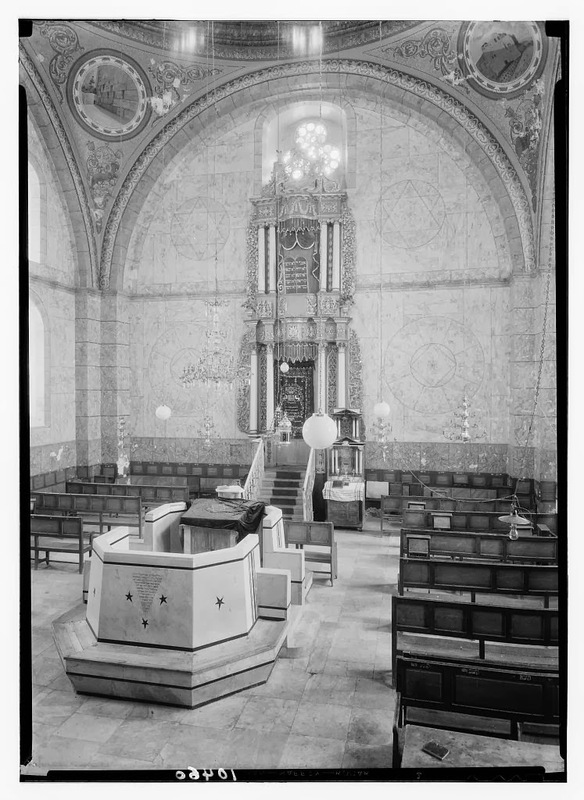 Interior of the Hurva Synagogue (circa 1898, American Colony Photograph Department, Library of Congress). Hebrew year ת"ר [which corresponds to 1839-40]"
to view the original pictures. Was it in the Hurva or the Tiferet Yisrael Synagogue? ... [After leaving the Wailing Wall] a meek, gentle Jew, in a long, plain brown dress, his light, glossy hair falling in ringlets on either side of his face, came to us, and, respectfully accosting Mr. Seward, expressed a desire that he would visit the new synagogue, where the Sabbath service was about to open at sunset. Mr. Seward assented. A crowd of "the peculiar people" attended and showed us the way to the new house of prayer, which we are informed was recently built by a rich countryman of our own whose name we did not learn. It is called the American Synagogue. It is a very lofty edifice, surmounted by a circular dome. Just underneath it a circular gallery is devoted exclusively to the women. Aisles run between the rows of columns which support the gallery and dome. On the plain stone pavement, rows of movable, wooden benches with backs are free to all who come. 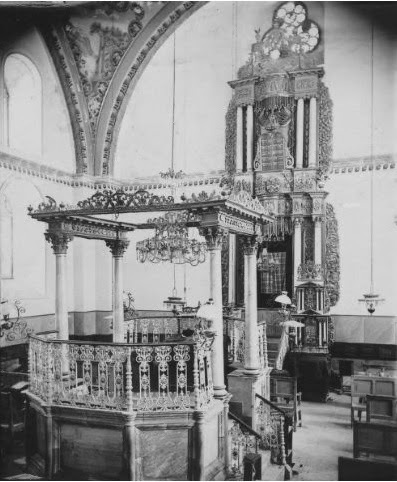 At the side of the synagogue, opposite the door, is an elevated desk on a platform accessible only by movable steps, and resembling more a pulpit than a chancel. It was adorned with red-damask curtains, and behind them a Hebrew inscription. Directly in the centre of the room, between the door and this platform, is a dais six feet high and ten feet square, surrounded by a brass railing, carpeted; and containing cushioned seats. 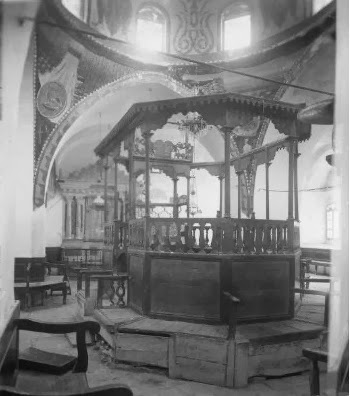 We assume that this dais, high above the heads of the worshippers, and on the same elevation with the platform appropriated to prayer, is assigned to the rabbis. We took seats on one of the benches against the wall; presently an elderly person, speaking English imperfectly, invited Mr. Seward to change his seat; he hesitated, but, on being informed by [Deputy U.S. Consul General] Mr. Finkelstein that the person who gave the invitation was the president of the synagogue, Mr. Seward rose, and the whole party, accompanying him, were conducted up the steps and were comfortably seated on the dais, in the "chief seat in the synagogue." On this dais was a tall, branching, silver candlestick with seven arms.